I just arrived in Cape Town, South Afrika. A beautiful place and great weather, which is a welcome change coming from wintery Sweden. Pictured above is the first store I went to, actually a very nice one. Here’s the last part before the checkout counters. Have you seen anything like it? I’m used to all the candy close to the counters back home. But I’ve never had to navigate a sugar-filled maze (soda! chocolate! cookies!) to reach the exit. I’m glad I didn’t have a child with me. I felt a bit like a rat in an experiment. Have you seen anything like it? Actually, we have a store in the Dallas area that has a nearly identical checkout line, complete with every sort of sugary concoction you can think of - and the really strange thing is; it's not a grocery store - it's a large electronics retailer! I can only guess that this is a profitable way to set up their business because they've been open several years with this same layout. If it wasn't making money for them, they'd have changed it by now. Hi, most shops in South Africa are structured like this one, and definitely a nightmare to navigate when you have your children with you! Sugar often tries to hold us hostage, especially with brightly coloured wrappers and branding! Yes, I've seen it in Australia too, mainly in Target I must say. Yup, plenty like that in England, including M&S, one of the biggest retailers! M&S in England does this. I like to squeeze the gummy sweets through the bag while I wait. A popular sporting goods store also has a checkout like this filled with pseudo sport drinks and snacks, a veritable sugar smorgasbord. Most food stores in SA is structured in this way. Counting on kiddies losing their marbles & mom's their patience. Scary thing is that a local stationary and bookstores is also employing this technique of late. Here in Austin, Whole Foods (of all places) has a similar one, too. One enters the store and immediately see sugar-frosting-laden cupcakes and cookies, next to a gelato case featuring bubblegum balls and bits of candy and fruit on top of the ice cream, and must wind one's way between a refrigerated case of puddings, fruit cups and sweet sodas on one side and a 20' long display of candy in order to get to the checkout. Yes it's all labeled 'natural' and 'agave' and 'no HFCS', Nonsense! Yes. Here in Brazil some supermarkets (Big, Condor) use this strategy. I have seen a similar set up at Canadian Tire, which is an automotive supply/hardware store chain. They usually have a few bins of discount sponges or brake-line anti-freeze in among the candy. Why not? It all has the same shelf-life. Most food stores in South Africa have looked like this for quite some time now (as I remember, Woolworths led the trend). But I've allways assumed this was a worldwide trend. Judging from your other commenters, I was right, and Sweden seems to be the exception in this regard. The "Grab-n Go" sign says it all! Yes doc, I feel the same in my country, Costa Rica, when I pass by to the clerk in a WallMart. Exactly the same!!! On the upside is the exexcise derived from walking the labyrinth. Interesting store name: Grab (a candy or two) 'n Go (walk, walk, keep on going). Yes, this is now the standard check-out arrangement in the USA for major stores: Safeway, Giant, Whole Foods, etc. Unfortunately, Australia is following this trend. I am very strong with my kids and now they don't bother asking anymore. I have been sugar free for a year and my kids know my answer. It is very funny since they usually answer their own question. As Nadine said Target is the main culprit with this in Australia. Although Office Works (stationary shop ?) is starting to do the same thing. Thumbs up to Woolworths (in my suburb) though - they even have confectionary free checkouts for the Mum with the 2-year-olds. Like Zed my older children also know that Mum does not buy sugary stuff. . 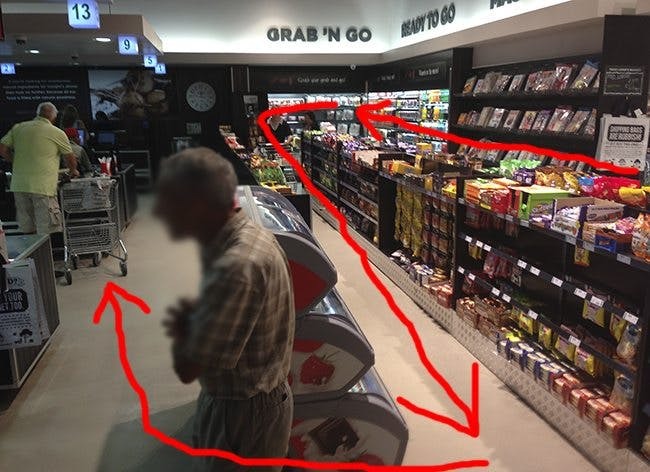 I live in Cape Town and most shops have this layout. I have two small children. I call this the aisle of death! When our kids got around 7 we added up what extra we spent on them excluding food, clothes and "base expenditures". The rest was given to them and they were advised to manage the weekly funds as they saw fit. After a few weeks of initial pitfalls with nothing for the rest of the week they would think very hard before ANYthing at all was bought, with sweets then around lowest priority. One fatality was our sons riding. He advised that he was going to spend it on other things! But all worked out ok; he mainly bought new bits and pieces to his mountain bike. Before they are old enough for something like above I agree, it can be an "aisle of death". Yet if they are fed less fast carbs like breakfast cereals and sustaining foods - lower carb foods - easy-triggered sugar cravings can be reduced and easier contained. Would LCHF kids be immune to these aisles? I doubt it but is there a marked difference? Many store chains worldwide use this "S bend" system in order to allow customers to pay for their purchases and exit the shop in an orderly fashion. Electronic signs direct customers first in the queue to the next available cashier. Many larger supermarkets and pharmacies have as many as 50 till points. In South Africa, Dis-Chem, Makro and Woolworths come to mind! gharkness, I was going to write about the very same retailer, and then saw your comment. I know that this retailer is Texas based, but we have plenty of their stores in my state, as well. The long check out is filled with sweets, sweets and more sweets, along with inexpensive, "last minute" electronics devices. Sometimes you can spend a while walking that line, so I imagine that a lot of sweets get sold to folks waiting to check out. I've been caught by this a few times. You go to the shop and only focus on the healthy stuff. They know you would not buy sweets, so they put it in the "death-line" while you are waiting you have to look at the sweets and now suddenly you start thinking about it. And when it's your turn the chocolate bar is on your till slip. You didn't even want it... and THAT is exactly why they do it, so that you will buy something you didn't want.